This combined image shows the March 29, 2014, X-class flare as seen through the eyes of different observatories. Four spacecraft and one ground-based observatory recorded the eruption of a powerful X-class solar flare on March 29, making it the best-observed such event in history, NASA officials say. This image shows three of five different views of a monster X-class solar flare on the sun on March 29, 2014. The sun storm was the best-observed solar flare in history, according to NASA. Solar flares are powerful explosions with energies exceeding that of millions of hydrogen bombs. Never before has an X-class flare — the most energetic type — been observed by so many telescopes at once. 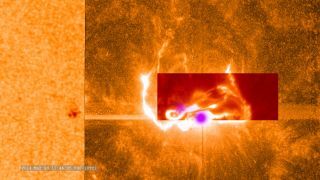 A NASA video of the monster solar flare features several views of the March 29 sun storm. The National Solar Observatory's Dunn Solar Telescope at Sacramento Peak in New Mexico witnessed the March 29 flare, as did Japan's Hinode satellite and three NASA spacecraft: the Interface Region Imaging Spectrograph (IRIS), Solar Dynamics Observatory (SDO) and Reuven Ramaty High Energy Solar Spectroscopic Imager (RHESSI). "Some of the spacecraft observe the whole sun all the time, but three of the observatories had coordinated in advance to focus on a specific active region of the sun," Jonathan Cirtain, project scientist for Hinode at NASA's Marshall Space Flight Center in Huntsville, Ala., said in a statement. "We need at least a day to program in observation time and the target — so it was extremely fortunate that we caught this X-class flare," Cirtain added. In addition, NASA's Solar Terrestrial Relations Observatory (STEREO) and the Solar and Heliospheric Observatory (SOHO), a joint NASA/European Space Agency effort, studied a coronal mass ejection (CME) that accompanied the flare. CMEs, superheated clouds of plasma blasted into space at millions of miles per hour, can wreak havoc if they hit Earth, spawning geomagnetic storms that can potentially disrupt radio communications, GPS signals and power grids. While countless devices monitor Earth's weather, only a handful of space observatories monitor the sun's activity, each of which has its own specialty. For instance, SDO can take images of the entire sun at once, while IRIS zeroes in on certain layers in the sun's lower atmosphere and takes much higher resolution images. Scientists are now analyzing the data from the multi-telescope observation to understand how solar flares start and peak, NASA officials said.